Between 1969 and 1974, the influential curator Lucy Lippard (born 1937) curated four decisive Conceptual art exhibitions, and in doing so reinvented the exhibition catalogue. 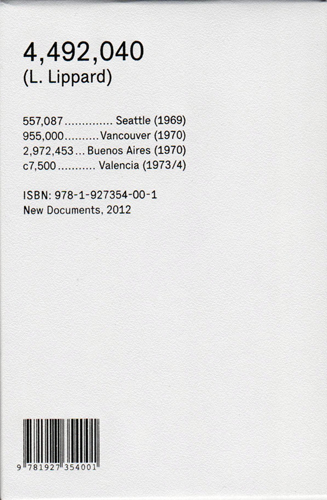 4,492,040 is a facsimile reprint of the extremely scarce and hugely important catalogues produced for those exhibitions: 557,087 (the Seattle Art Museum), 955,000 (the Vancouver Art Gallery), 7,500 (the California Institute of Art) and 2,972,453 (the Centro de Arte y Comunicación). Titled after the populations of the cities in which the shows were held, each catalogue was an envelope of loose note cards containing statements, documentation and conceptual works by each artist, to be rearranged, filed or discarded at will. If Lippard described Conceptual art as the dematerialization of the art object, these catalogues effectively announced the dematerialization of the art exhibition. (One reviewer claimed Lippard had been the artist, and that her medium had been other artists.) 4,492,040 includes such iconic figures as Vito Acconci, Carl Andre, Siah Armajani, Terry Atkinson, John Baldessari, Michael Baldwin, Robert Barry, Rick Barthelme, Daniel Buren, Rosemarie Castoro, Hanne Darboven, Walter de Maria, Jan Dibbets, Christos Dikeakos, Eleanor Antin, Dan Graham, Hans Haacke, Eva Hesse, Douglas Huebler, On Kawara, Edward Kienholz Sol LeWitt, Roelof Louw, Duane Lundon, Bruce McLean, Robert Morris, N.E. Thing Co., Bruce Nauman, Adrian Piper, Allen Ruppersberg, Ed Ruscha, Richard Serra, Robert Smithson, Jeff Wall and Lawrence Weiner.